Students present their ideas for school food at the "Let's Eat" event on May 25. 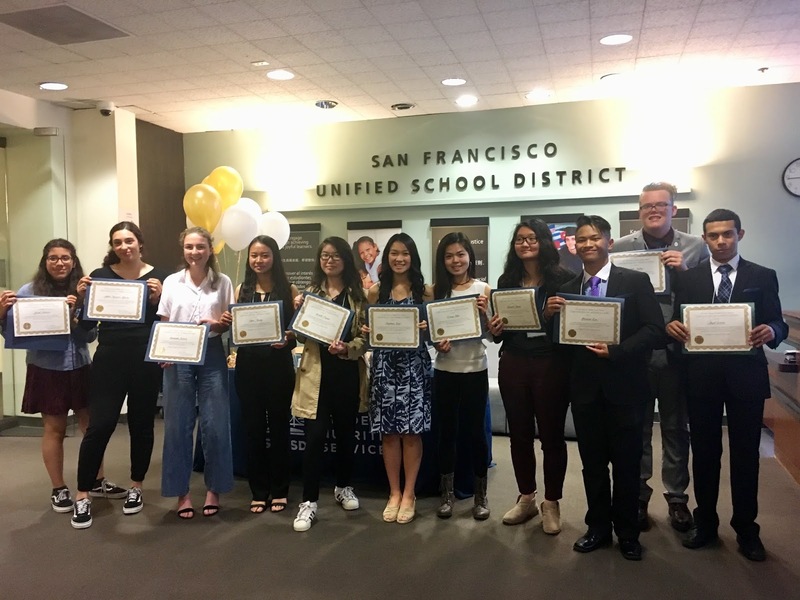 On Friday evenings for the past semester, a group of San Francisco Unified School District (SFUSD) high school students have collaborated with Student Nutrition Services to reimagine and provoke system-wide change within SFUSD's food system. Throughout the semester, the SFA utilized the five step human-centered design thinking process: empathize, define, ideate, prototype and test to engage with their school community and develop innovative design concepts. 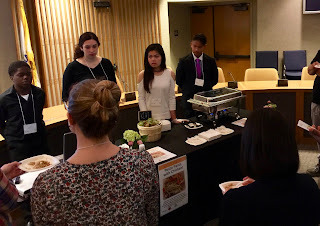 On Friday, May 25, students presented their design concepts at “Let’s Eat!”, an event hosted in the Board of Education chambers for students, families, teachers and district administrators. 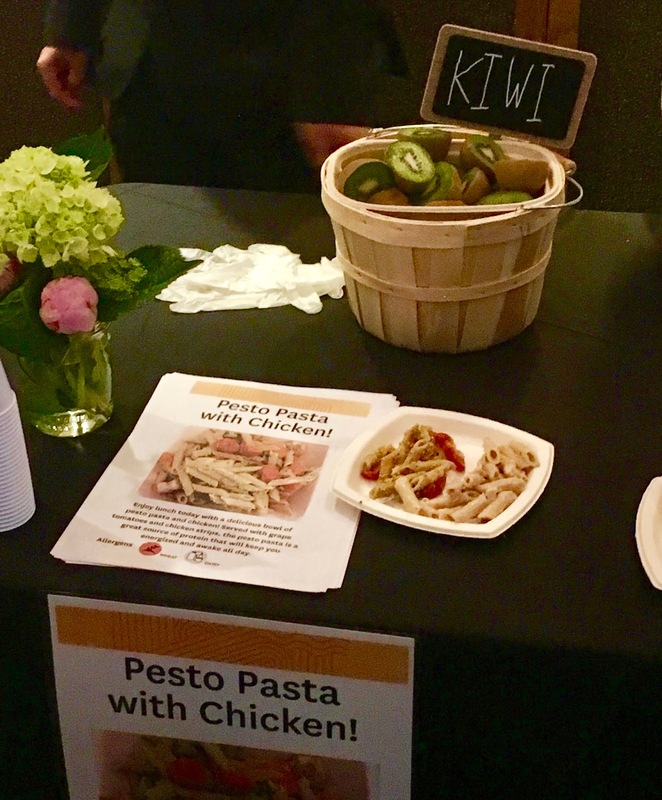 Students explained how they designed new menu items based on three general concepts: larger portion sizes, vegan alternatives and more culturally diverse options. 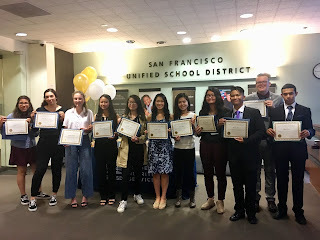 All ideas followed the USDA nutritional guidelines, SFUSD Wellness Policy, and a budget of $2.50 for the food to tackle their design challenge. Students discussed the importance of seeing their concepts incorporated into their school menus. A sample meal that students helped to develop. Lincoln High student Harrison Lee worked on a different concept, “Operation Eat,” to ensure all students feel satisfied and full with the dining experience at school. “Operation Eat” utilized inexpensive and satiating ingredients to create a Chicken Pesto Pasta and Rogeli Alfredo Pasta recipe that are satisfying and filling. 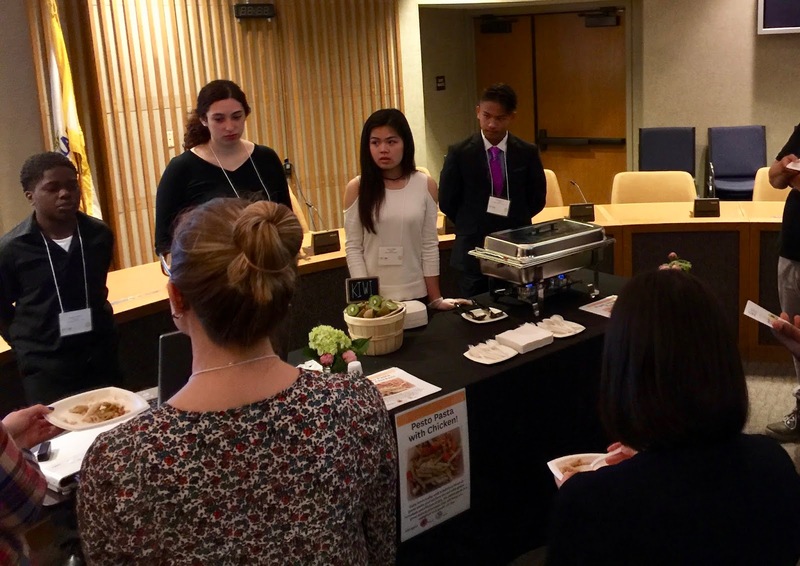 The third concept from students, “World Food,” calls for schools to provide culturally appropriate and diverse meals that taste like what students are familiar with. Students shared the demographics of SFUSD and pointed out that the school lunch doesn't represent the majority of them. “Every culture deserves to be represented in the school lunch,” said Stephanie Lieu from Washington High School. Students present their ideas for school food at the "Let's Eat" event. At the end of the presentation a panel discussion was moderated by Jack Calvin, a student from Mission High, where students engaged in a conversation about their experience on the School Food Advisory and the design-thinking journey. Yaheli Garcia from John O’Connell said, “The School Food Advisory gave me the opportunity to provoke change and focus on solutions to improve the lunch." Students who are are interested in joining the School Food Advisory may contact SFUSD's Future Dining Experience Youth Engagement Coordinator, Juri Sanchez, at Sanchezj7@sfusd.edu.